XpertMart��s Accounts Receivable (AR) module gives you all of the tools you need to manage your sales on credit with your customers. To begin with, the module can be used as a stand-alone program to manage credit accounts without ever interacting with the Point of Sale. In addition, the AR module can also be used as a fully integrated part of XpertMart�s Point of Sale. XpertMart��s AR module resides on the Main in the Multi-Store Edition and can be included in the Single-Store Edition. In a multi-store setup the Remote Stations only interact with the AR module through the Point of Sale. The first field is Credit Limit. At the Main Station this field is editable and used to put the customer�s maximum credit limit. The second field is Balance, which is not an editable field. The AR Module will automatically update this field with the amount owed by the client. The third filed is Days Credit. This field can be edited at the Main station and is used to enter the maximum number of days the customer has to pay for the purchases bought on credit. In transactions made at the Point of Sale the Due Date will automatically appear as the Days Credit added to the current date of the transaction. The Days Behind field displays the days that have passed since the balance was due. 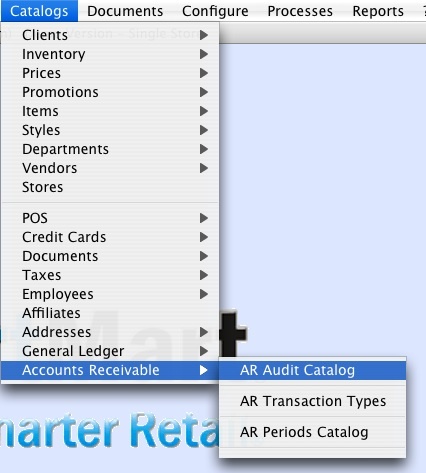 The AR Audit Log gives a complete transaction history for a customer's credit account. It includes the date and time in which a transactions was made, the type of transaction which was made, the unique document number for the transaction followed by the starting balance prior to the transaction, the amount of the transaction and finally the ending balance after the transaction is accounted. As can be seen in this image, this catalog has the same data found in AR Audit Log. Perhaps the main reason for using the AR Audit Catalog is to run the reports associated with this catalog. 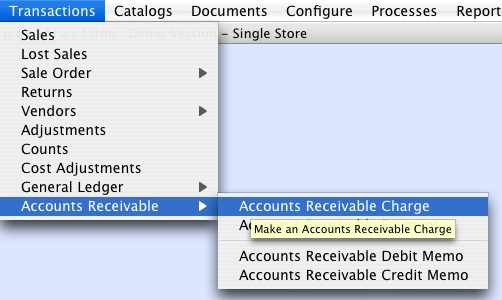 Once you select this option the AR Transaction Types Catalog will open. The catalog includes a field where you can assign a name as well as an internal ID number that is not editable. XpertMart� uses Transaction Type ID = 1 as a charge or something that was sold on credit and for which payment is still due. You can give this Transaction Type whatever name you wish but XpertMart� will assume it is a charge. Transaction Type ID = 2 is used as a payment against a balance that is due. Transaction Type ID =3 is used a debit memo. These are used for charges that do not arise from normal sales. 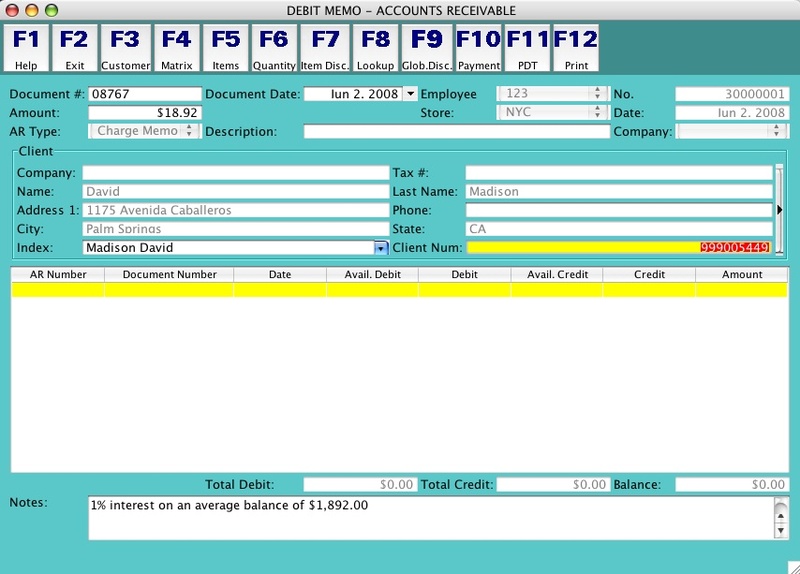 For example, debit memos can be used for surcharges if a check is returned, for a late fee or special interest charge. The last Transaction Type is ID = 4 and is used for credit memos which are used to credit an account and reduce the amount owed outside of taking in a payment. For example, if you offer a discount for quick payment, you would want to use Transaction Type ID = 4. As mentioned before, you can use whichever names you'd like for these transaction typeswithout affecting the underlying functionality just described. 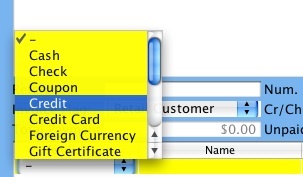 At present, only four transaction types are used. Use the first field for the name you want to use for the period. You can use whichever name you like. Then select how many days past due mark the beginning of hte period and how many days past due mark the end of the period. As can be seen in the image above, you must have an initial period that starts with zero days past due. This initial period is for accounts that ar considered current. You can use the number of days you'd like, but the important thing is not to skip any days. For example, if one period ends with 30 days then the next period must begin with 31 days. Also, you must enter the periods you want to use in order such that Period ID = 1 is used for current accounts, Period ID = 2 is used for accounts that are more than one day past due, and so on. The AR Aging Report will used these periods to display overdue accounts. The last entry in the AR Periods Catalog is for all delincuent accounts over "x" days past due. For example, if the final period runs to 120 days, then you must add another entry in the catalog which begins with 121 days past due and runs to 9,999 days past due. This period could be called "More than 120 Days" for example. There are a number of fields in which to enter data. The Document # field refers to the number of the document which generated the Charge such as the number of the invoice which was sold on credit. The Document Date refers to the date of the document which generated the charge. This date may be different than the date of the Charge itself. The Employee field is non-editable and is filled in automatically with the Employee Number of whoever is logged in at the time. The No. field is the unique document number for this charge transaction. This number is generated automatically by the system and runs sequentially starting with 10,000,000. On the second line of the transaction screen is the Amount field which is where you enter the amount that is being charged. The Due Date field is where you enter the date on which the amount being charged is due for payment. 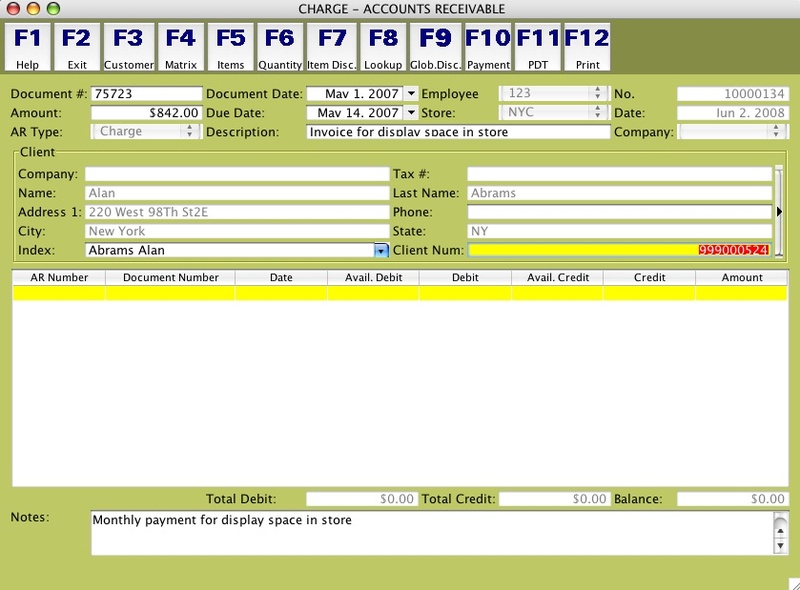 The Store field displays the store number where the charge is being made and is filled-in automatically by the system and is not editable. If you are making the charge at the Main then this field is left blank. The Date field displays the date of when the charge is being made (today's date) and is not editable. 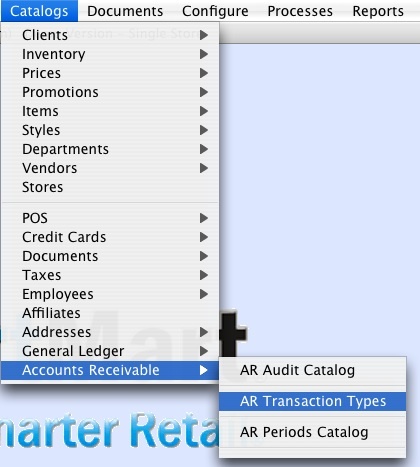 On the third line, the AR Type field displays the name for the transaction type you entered into the AR Transaction Types Catalog with an ID = 1. This field is not editable. The Description field is an open field where you can enter a description for the charge being processed. 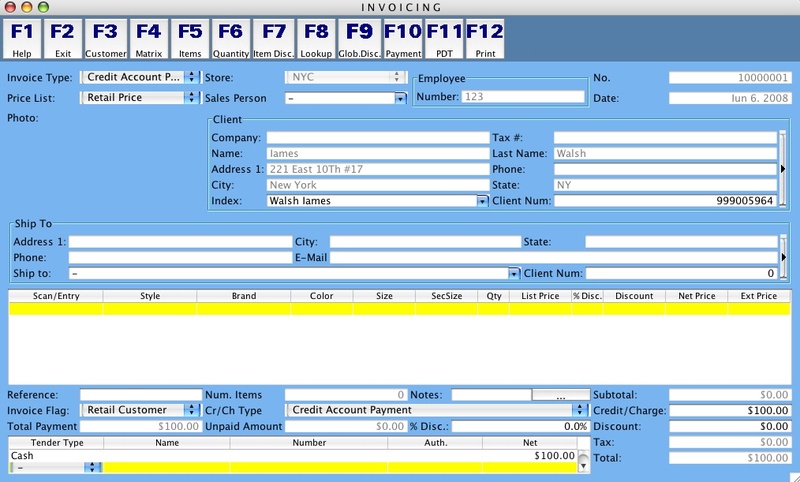 The Client field works the same way it does in an Invoicing screen. You can do a Lookup by Example by Last Name to enter the client for which the Charge is being processed. The next section details the AR transactions and documents which are used to pay this charge. The Total Debit, Total Credit and Balance fields reflect the totals of all transactions listed in this section. The Balance field displays the total amount of the charge minus any credits and debits which have been applied. This transaction details section is explained below. Lastly, the Notes field allows you to enter an explanation for the charge being process or include special instructions. If after entering all of the relevent information pertaining to a charge in the fields described above you wish to appy any open credits or positive balances, you can do so simply by pressing the Payment <F10> button. At this point you need to decide if you'd like to apply any open credits yourself of let the system do it. If you are not ready to decide, press <Cancel>. Whenever XpertMart� automatically applies open credits it will always apply these to the oldest document first and, if there's still a positive balance left, will then apply it to the second oldest document and so on in order. If the balance of the open credit is less than the total amount due on a document then XpertMart� will apply the full credit and leave the remaining balance as pending to be paid. If on the other hand you elect to apply open credits manually then you can decide the amounts you wish to apply to the documents of your choosing. The first thing to notice ist aht XpertMart� will add a line which registers the current transaction being processed. In the image above, the first line refers to AR Transaction number 10000014 and the amount being charged is $300. The second line shows that XpertMart� found document number 20000001 which has an open credit of $17.50 which has not yet been applied to any prior document so XpertMart� is applying it now. That's why it shows up under the Credit column. In this case XpertMart� also finds the open credit of $17.50 from document 200000001 which this client has in their favor. Since this credit has not been used before, XpertMart� places it in the Available Credit column so that the user knows it's available. If you wish to use this credit then you have to manually enter the amount ($17.50) in the Credit column. Or you can choose to only use a portion of this credit and enter it in the Credit column. To save and print these changes you need to click <F12>. 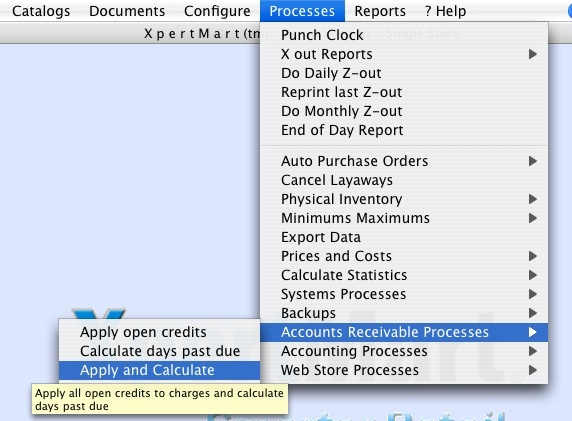 Note that if before you press <F12> you change the amounts or enter a different client then XpertMart� will not save any of the transaction detail. 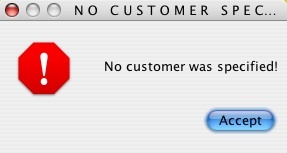 You must press <F12> for your transaction detail to be saved. Just as when you press <F10> to commit a Charge, XpertMart� will check to see that you've specified a client and have entered an aount before printing. XpertMart� will also check to see that you've specified a Document Number and will display an error notice if you have not. If all of the infromation is complete (client, amount and document number) then XpertMart� proceeds with the transaction. If after applying open credits the Charge still has an active balance then XpertMart� will ask you if you'd like it to apply any open credits to the document. These would be any open credits you had previously not applied. If you'd like XpertMart� to apply these automatically, then click <Apply>. 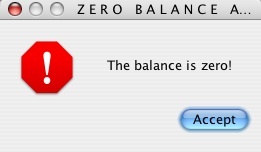 If you'd like to leave the balance as pending to be paid, then click <Don't Apply>. If you decide you don't wish to save and print the transaction then you can click <Cancel> and the transaction screen will clear out. As can be seen above, the fields that need to be filled out are the same as when making a Charge transaction. The only difference is that the amount will be credited to the customer's balance instead of debited. All AR Payment documents begin with document number 20,000,000. When looking at the AR Audit Log you can tell just by looking at the document number which transactions are Payments (start with 2) and which are Charges (start with 1). The <F10> Payment button works the same way only instead of applying credits you will be applying debits. This is because you will be choosing which open balances to apply this payment against. The <F12> button works the same as before and is used to save and print the transaction. None of the payments are applied until you actually press <F12>. As seen with Charges and Payments, the fields to fill out are the same and the <F12> and <F12> keys work the same way. In fact, a Debit Memo works exactly like a Charge does, the only difference being the document number which starts with 30,000,000. As seen with Charges and Payments, the fields to fill out are the same and the <F12> and <F12> keys work the same way. In fact, a Crebit Memo works exactly like a Payment does, the only difference being the document number which starts with 40,000,000. The printing format for each of the four AR transaction types can be set by going to Configure>Configure Documents>AR Transaction Format. 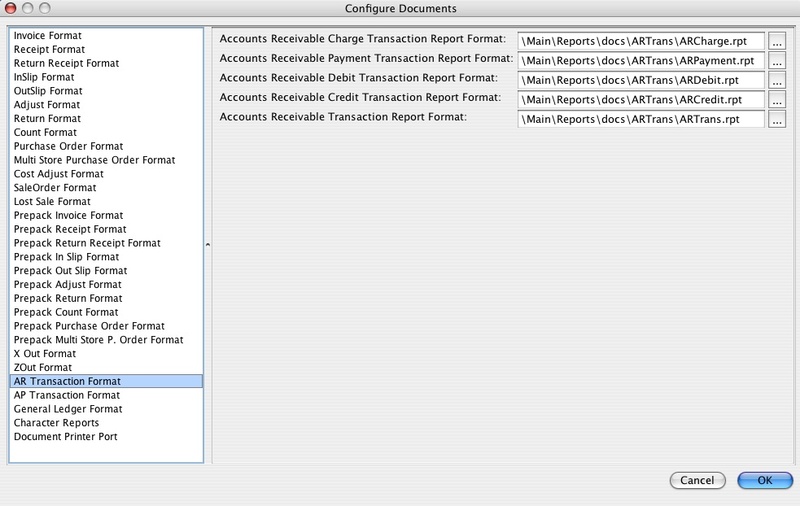 Select the report format you want to use for each transaction type. The default formats are shown above. 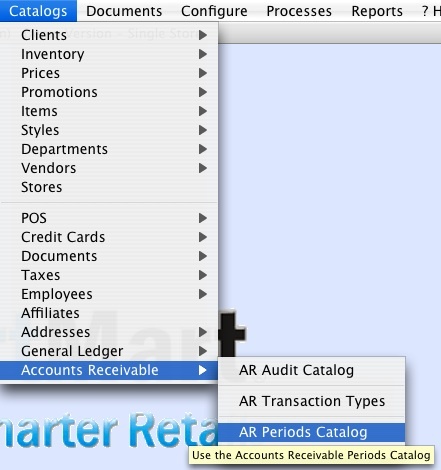 All four AR Transaction Types are found here. You can use all of XpertMart�'s usual Catalog and Search functions to find the data you're looking for. The AR Documents screen has two addiitional fileds that the AR Transaction screen does not have. The Past Due Days field displays how many days past due is the balance. The number of days past due is based on the last time you ran the process to calculate days past due. The Past Due field displays the AR Period the balance falls under. After displaying this message XpertMart� will not do anything further since the transaction does not have any open balances. 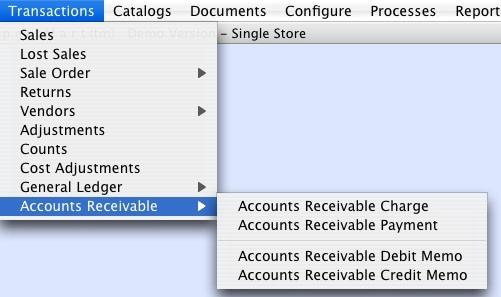 The functionality here is the same as described earlier when using the <F10> Payment button in a Transaction screen. The only difference is that instead of pressing <F12> to save the changes and print, in the Documents screen you will press the Payment button on the toolbar a second time to commit the changes. When you press the Payment button a second time the system will ask you to confirm that you want to commit these changes to the Document you are looking at. Press <Yes> to commit these changes to the Document. If you press <No> the credits will not be applied. Note that the example above dealt with applying open credits to Charges and Debit Memos but the procedure is exactly the same for apply open debits to Payments and Credit Memos. 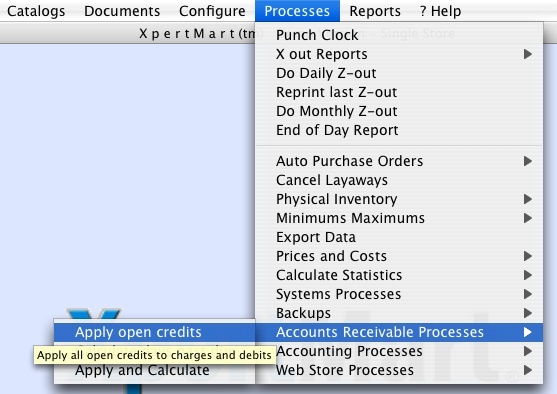 Once you select this option, a dialogue window will appear notifying you that XpertMart� is applying the open credits. When the dialogue window closes it means the system is done applying open credits. When you select this option a dialogue window will appear notifying you that the system is calculating the days past due. When the dialogue window closes it means the system is done calculating days past due. Note that the number of days past due is based on the last date you ran the Calculate days past due process so it is important to run this processes before running any AR Reports. 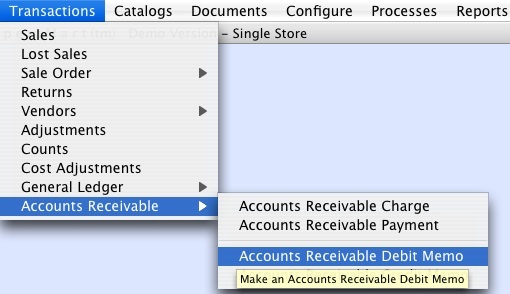 The last option in the Accounts Receivable Processes menu is to run both processes at the same time. 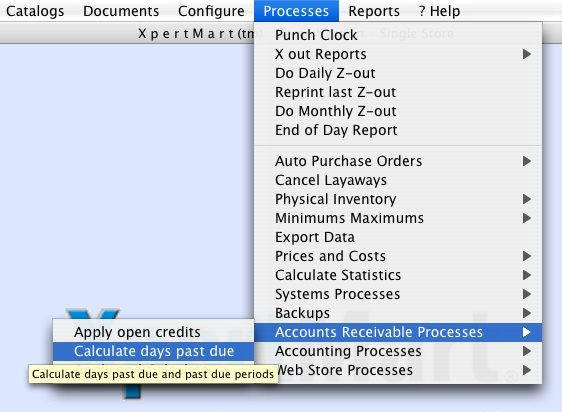 When you select this option XpertMart� will first apply all open credits and will then calculate days past due. This way if after applying an open credit a charge now has a balance of zero it will show zero days past due and the account will be considered current. 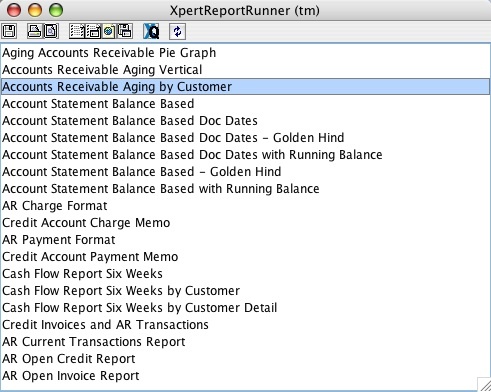 This concludes the overview of Accounts Receivable as a stand-alone module in XpertMart�. We will now see how AR integrates into the Point of Sale. 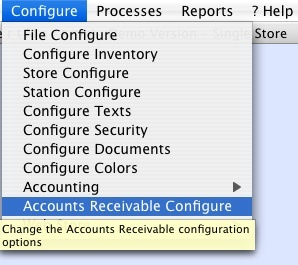 The first configuration option on the left-side menu is Accounts Receivable Posting. If you check the box that says "Automatically apply charges and payments from POS" then the system will automatically update each client's records in the AR Module. If you don't check this option then all charges and payments made at the POS are left open for you to apply later at the Main using the AR Module. If you're going to be applying charges and payments automatically at the Main anyway, you might as well go ahead and select this configuration option now. The second configuration option is called Credit Balances. If you select the "Increase credit balance when purchases are paid via credit" box then each client's available credit will adjust dynamically as payments are made and open credits are applied. Note that Credit must be Payment Type ID = 7 when you setup the Payment Types Catalog. Refer to the Required Entries topic for further informaiton. 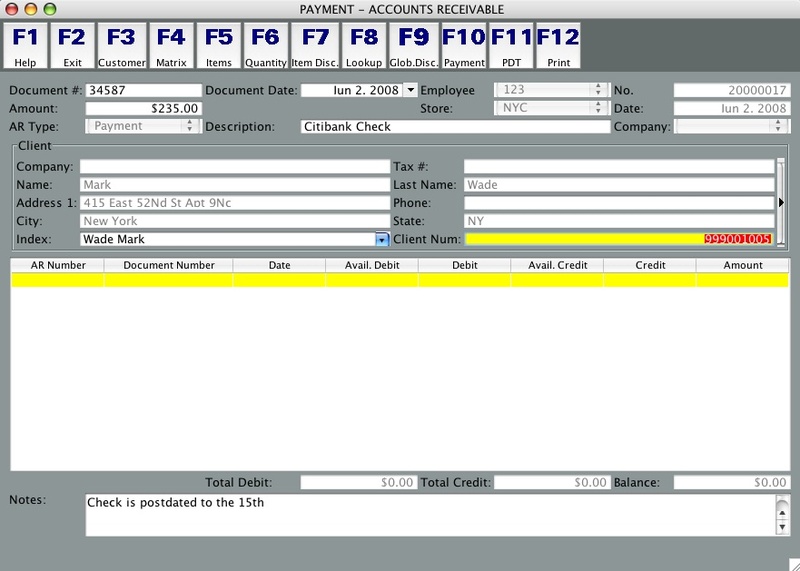 When you select Credit as the tender type XpertMart� will first check to see if you've entered a Client in the Invoice. If you have left the Client field blank, XpertMart� will not let you use Credit as a tender type. Next, XpertMart� will check that the Client you've selected has available credit greater than the amount being charged in the Invoice. Available credit is calculated as the Credit Limit you entered in the Client Catalog minus any open charges and debits that have not yet been paid. If you are using XpertMart�'s Single Store Edition then any sale made on credit will automatically be applied at that moment to the AR Modlule. If you are using the Multi-Store Edition then all sales made using the Credit tender type will be applied to the AR Module after a synchronization cycle. XpertMart� will record the Invoice number as the Document number in the AR Transaction. In the Notes field of the AR Transaction, XpertMart� will insert the Invoice's reference field. The AR Module will record a Due Date equal to the date of the Invoice plus the Days Credit you've previously assigned in the Client Catalog. You can also receive payments towards a clients AR balance at the point of sale. To be able to do this you first have to create new entries in two catalogs. First, create an Invoice Type with ID = 12 called "Credit Account Payment" in the Invoice Types Catalog which is found under Catalogs>Document Types>Invoice Types. 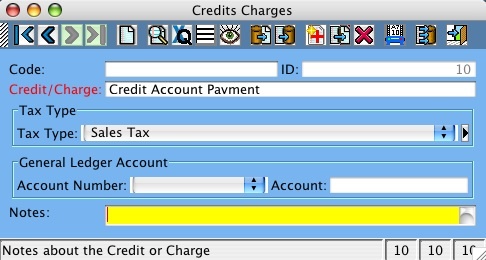 Next, create a Credit/Charge type with ID = 10 called "Credit Account Payment" in the Credits Charges Catalog which is found under Catalogs>POS>Credits/Charges. 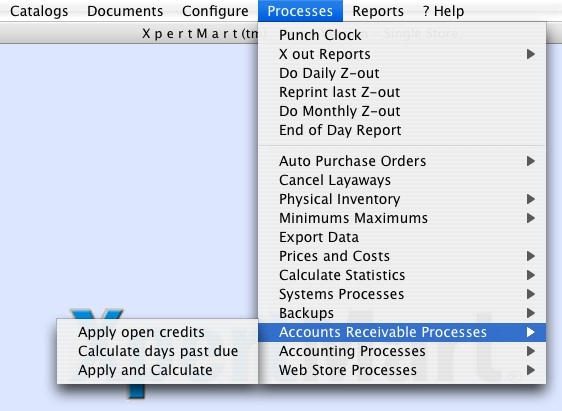 When you're in an Invoicing screen if you pick Invoice Type ID=12 (Credit Account Payment) then XpertMart� will automatically fill in Credit/Charge Type ID = 10 int he Cr/Ch Type drop-down menu. 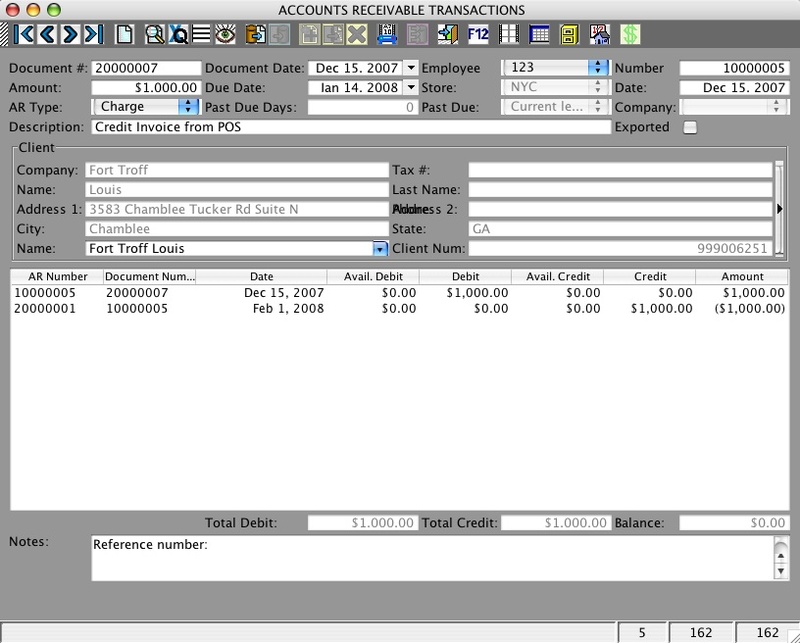 In the Creidt/Charge field, enter the amount the client is paying. Obviously you also need to enter a ame in the Client field and you must specify the Tender Type being used to make the payment. In the example below, the Client is making a $100 payment towards his AR balance and is paying cash. You must specify a Client in order to continue. Likewise, XpertMart� will check to see that you are using Credit/Charge Type ID = 10. If you are not, you will also see an error notice and you will have to change the entry in the Cr/Ch Type drop-down menu to Credit Account Payment. As with selling on credit at te point of sale, if you are using XpertMart�'s Single Store Edition then any payments made at the point of sale will instantly be applied to the AR Module. If you are using XpertMart�'s Multi Store Edition then they will be applied after a full synchornization cycle. XpertMart� will record the Invoice number as the Document number in the AR Transaction. In the Notes field of the AR Transaction, XpertMart� will insert the Invoice's reference field. The AR Module includes several reports you can use to manage your client's credit accounts. 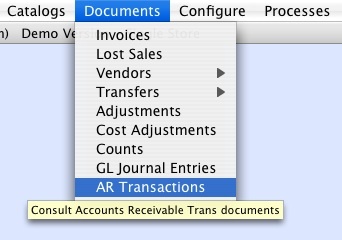 These are found by going to Documents>AR Transactions and clicking on the Reports button. Most of these reports are also found in the Clients Catalog. The "Account Statement Balance Based with Running Balance" report will produce Balance Statements for each client showing all activity and the resulting balance for a given date range. The "Accounts Receivable Aging Vertical" report will show all the overdue balances grouped by AR Transaction Period. Copyright � 2008 Tech Soft, Inc.